It was nice to be home with the family for Thanksgiving, and to finally take some time off. A fun little activity which took up a lot of our time over the past weekend was Bananagrams, which, if you don’t already know, is sort of like a more action-packed version of Scrabble without the board. Being the type of guy that I am, I started to think about the distribution of letters in the game. A little Googling led to some prior art to this post. The author did something neat (which I wouldn’t have thought of) by making a sort of bar chart using the game pieces. 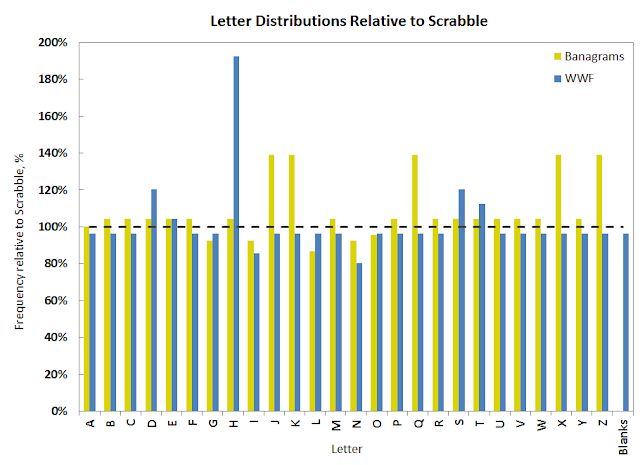 Strangely though, they chose not to graph the different distributions of letters in Bananagrams and Scrabble but instead listed them in a table. Looking at the graph, it’s clear the Bananagrams has more tiles than the other games (the total counts are 144, 104 and 100 for Banagrams, Words with Friends and Scrabble respectively) and notably also does not have blank tiles of which the other games have 2 each. Besides the obvious prevalence of vowels in all 3 games, T, S, R, N, L and D also have high occurrence. Here it is interesting to note that the relative frequency of H in Words with Friends is nearly double that in Scrabble (~192%). Also D, S and T have greater relative frequencies. The remaining letters are fairly consistent with the exception of I and N which are notably less frequent. Bananagrams relative letter frequency is fairly consistent overall, with the exception of J, K, Q, X, and Z which are around the 140 mark. I guess the creator of the game felt there weren’t enough of the “difficult” letters in Scrabble. There’s more analysis that could be done here (looking at the number of points per letter in WWF & Scrabble versus their relative frequency immediately comes to mind) but that should do for now. Hope you found this post “a-peeling”. 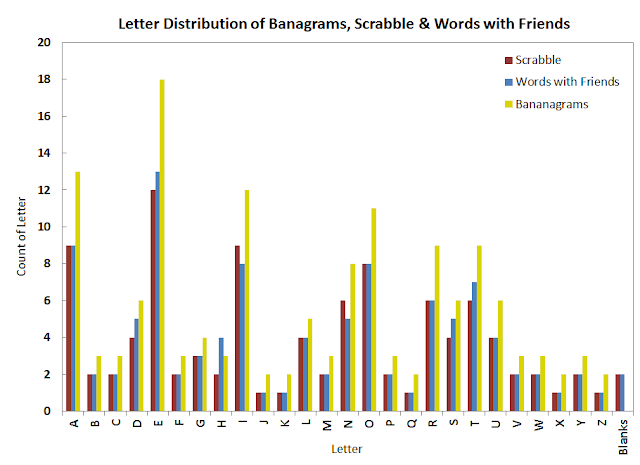 Author mylesPosted on October 18, 2013 Categories bar charts, dataviz, quick plot, scrabbleLeave a comment on Bananagrams!!! Are the dice in Mario Party fair? Are We Solving The Wrong Problems With Machine Learning? How Often Does Friday the 13th Happen?